Laurentian Chronicle (Лаврентіївський літопис; Lavrentiivskyi litopys). 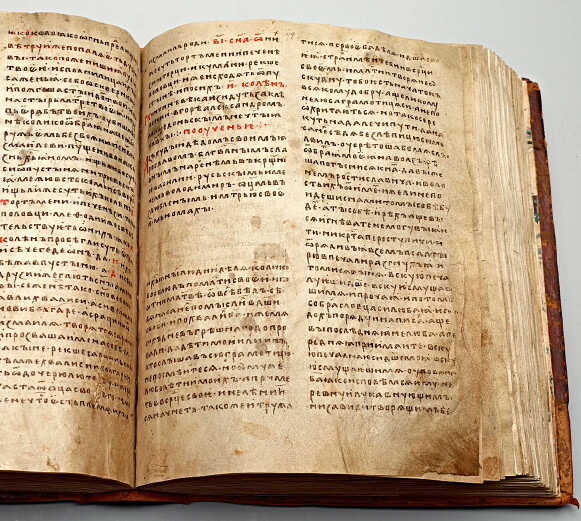 One of the oldest compendiums of Kyivan Rus’ chronicles. It is named after the monk Lavrentii, who copied it in 1377 for Prince Dmitrii Konstantinovich of Suzdal. The original is preserved at the Saint Petersburg Public Library. It contains the chronicle Povist’ vremennykh lit (second redaction, 1116) and the chronicle compiled for Prince Mikhail Yaroslavich of Vladimir, which describes events until 1305. The pages for the years 898–922, 1203–5, 1263–83, and 1288–94 are missing. The text of Prince Volodymyr Monomakh's testament, Poucheniie ditiam, appears in the middle of a narrative about people imprisoned by Alexander the Great of Macedonia and Monomakh's epistle to Prince Oleh (Mykhail) Sviatoslavych. The chronicle was discovered in 1792 at the Vladimir Monastery of Christ's Nativity by A. Musin-Pushkin and was published in its entirety in 1846 as the first volume of the full collection of the Rus’ chronicles. A second edition, edited by Evfimii Karsky, was published in 1926–8 and reprinted in 1962.